Song written by Kate Bush, released on Kate's debut album The Kick Inside. The song is about religion, and the teachings of Jesus and George Gurdjieff, among others. The song expresses an insistent desire to learn as much as possible, while she is still young. A live version of 'Them Heavy People' was the lead track on the On Stage EP, released in 1979, and this live version came with a music video. 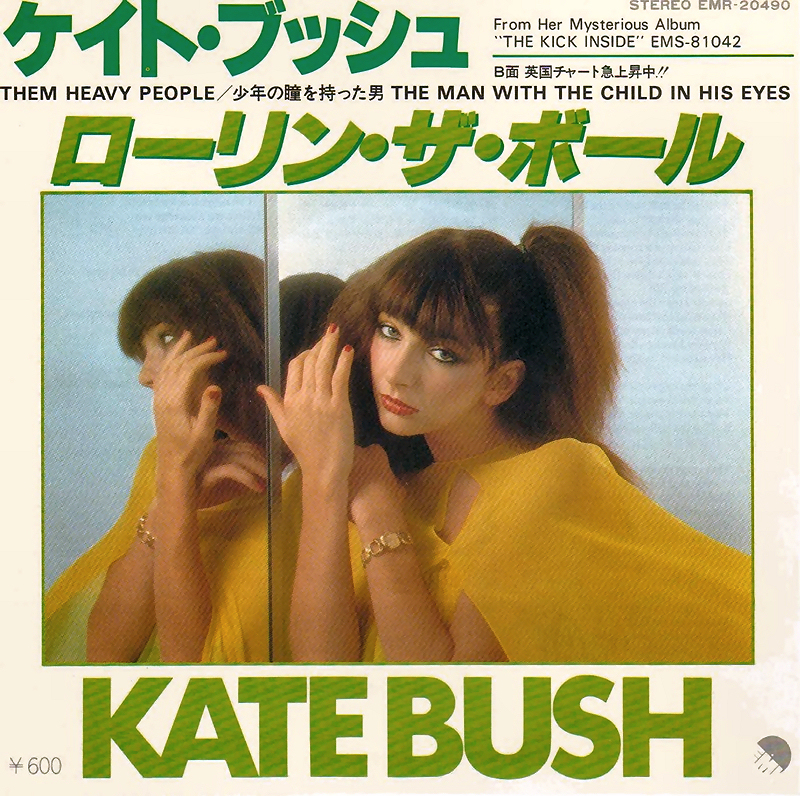 'Them Heavy People' was released as a single in Japan only. This single featured The Man With The Child In His Eyes on the B-side. A Seiko logo appears on the insert's back side, which makes it Bush's only commercial release featuring any kind of product endorsement. A live recording of this song was the lead track on the On Stage EP. Bush performed 'Them Heavy People' on several TV programmes, including her only appearance on Saturday Night Live in the USA and the 1979 Christmas special. 'Them Heavy People' was covered by Jason Ajemian, The Hounds Of Love, Niki Romijn and Ray Shell. The idea for 'Heavy People' came when I was just sitting one day in my parents' house. I heard the phrase "Rolling the ball" in my head, and I thought that it would be a good way to start a song, so I ran in to the piano and played it and got the chords down. I then worked on it from there. It has lots of different people and ideas and things like that in it, and they came to me amazingly easily - it was a bit like 'Oh England', because in a way so much of it was what was happening at home at the time. My brother and my father were very much involved in talking about Gurdjieff and whirling Dervishes, and I was really getting into it, too. It was just like plucking out a bit of that and putting it into something that rhymed. And it happened so easily - in a way, too easily. I say that because normally it's difficult to get it all to happen at once, but sometimes it does, and that can seem sort of wrong. Usually you have to work hard for things to happen, but it seems that the better you get at them the more likely you are to do something that is good without any effort. And because of that it's always a surprise when something comes easily. I thought it was important not to be narrow-minded just because we talked about Gurdjieff. I knew that I didn't mean his system was the only way, and that was why it was important to include whirling Dervishes and Jesus, because they are strong, too. Anyway, in the long run, although somebody might be into all of them, it's really you that does it - they're just the vehicle to get you there.